SEOUL, Oct. 26 (Yonhap) — LG Chem Ltd., South Korea’s top chemicals firm, said Friday that its third-quarter net profit fell 36.5 percent from a year earlier due mainly to increased facility investments. Net profit reached 346.6 billion won (US$303.6 million) in the July-September period, compared with a profit of 545.4 billion won the previous year, it said in a regulatory filing. Operating income declined 23.7 percent on-year to reach 602.3 billion won, but sales rose 13.1 percent to a quarterly record of 7.23 trillion won over the cited period, the company said. The company’s battery unit logged operating income of 84.3 billion won on sales of 1.7 trillion won due mainly to brisk sales of electric vehicles. LG Chem said its electric vehicle batteries alone would generate 10 trillion won in sales in 2020. On Tuesday, LG Chem announced that it will invest 2.1 trillion won by 2023 to build electric vehicle batteries in Nanjing in southeastern China to meet growing demand for batteries for zero-emissions cars. The plant is set to roll out electric vehicle batteries that can power more than 500,000 electric vehicles. The first phase of production is set to begin late next year. LG Chem has another electric vehicle battery plant in Nanjing. It also operates electric vehicle battery plants in South Korea, the United States and Poland. 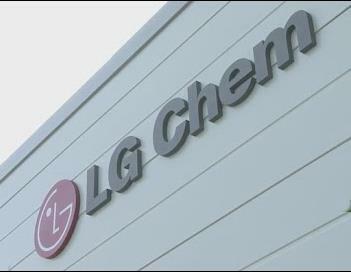 Currently, LG Chem is a key supplier of batteries to U.S. auto giant General Motors Co., Volvo and Renault, as well as South Korea’s largest carmaker, Hyundai Motor Co., and its smaller affiliate, Kia Motors Corp.
Shares in LG Chem fell 4.57 percent to 324,000 won. The broader KOSPI shed 1.75 percent.